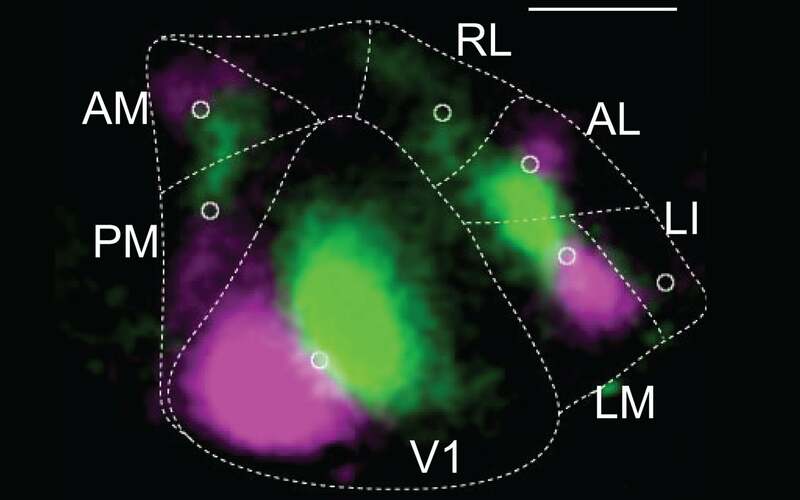 The large, triangular-shaped central area identifies the primary visual cortex in mouse. 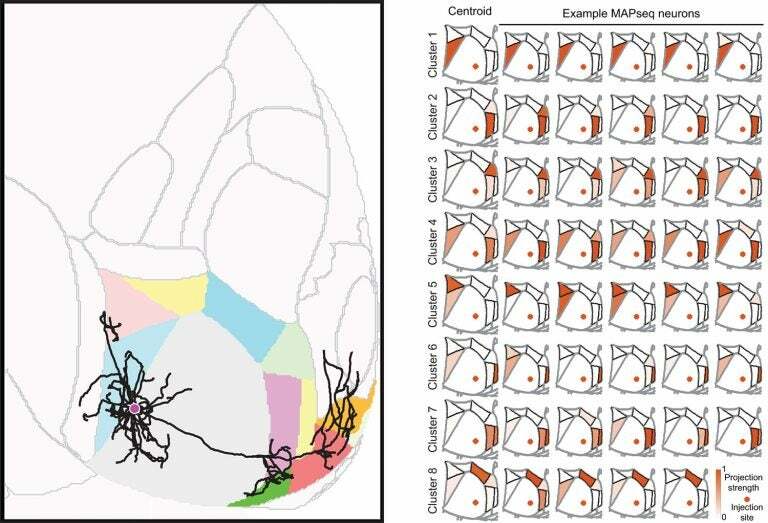 By "barcoding" 591 neurons in this region, the team used MAPseq to discover patterns of their projections to nearby higher visual cortical areas. Each of the latter is identified in this calibration image, which registers the brain's reaction to two different kinds of visual stimuli (registering in pink and green fluorescence). Researchers used MAPseq, a revolutionary brain mapping method, to make a discovery that will force neuroscientists to rethink how areas of the cortex communicate with one another. They discovered how neurons in the primary visual cortex project to other cortical areas, each cell often linking up with cells in multiple areas, in patterned ways. 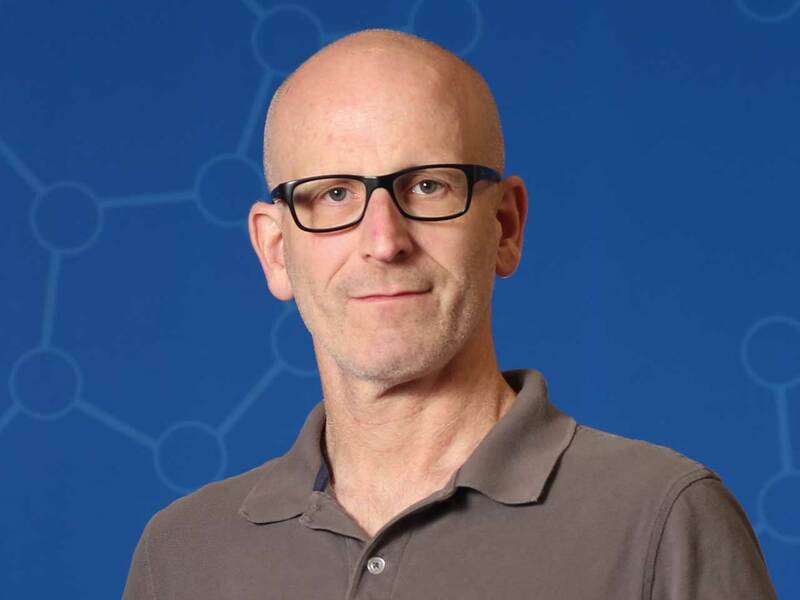 Cold Spring Harbor, NY — Using a revolutionary new brain-mapping technology recently developed at Cold Spring Harbor Laboratory (CSHL), an international team of scientists led by Professor Anthony Zador have made a discovery that will force neuroscientists to rethink how areas of the cortex communicate with one another. Left: Single-neuron tracing reveals the projections of a single neuron in the mouse brain. It took the team 3 years to map 31 such neurons. In 3 weeks and at a fraction of the cost, MAPseq discovered the destinations of 591 neurons in the mouse primary visual cortex, reaching similar conclusions about projection patterns. The ‘readout’ is dramatically different (right), showing 8 projection ‘motifs’ (8 clusters, read horizontally), with strength of connections in parts of the higher visual cortex displayed in color intensities. The wiring diagram of the cortex determines how information is processed across dozens of cortical areas. “If we don’t know how information is combined even at the earliest stages, then we have essentially no shot of figuring out how the brain works.” says Justus Kebschull, now a postdoctoral researcher at Stanford University who was instrumental in developing MAPseq as a graduate student in Zador’s lab. In a MAPseq experiment, hundreds or thousands of neurons are labeled uniquely with random RNA sequences (“barcodes”) via a single injection made in the brain. The barcodes are transported into the branching axons of each labeled neuron, where they can later be read out by high-throughput barcode sequencing after the brain is dissected. This process allows researchers to identify every brain area that each barcoded neuron makes contact with. The Zador lab has begun to use MAPseq to compare the brains of a mouse autism model with healthy mouse brains to see if mis-wiring occurs during development at the single-neuron level that might explain the disorder’s symptoms—just one of many potential applications of the method. Han Y et al, “The logic of single-cell projections from visual cortex,” appears online March 28, 2018 in Nature.